With his swashbuckling adventures, best-selling novelist Patrick O'Brian transports you to the high seas of old where privateers lurk in the mist, and great ships fight to control the waterways. 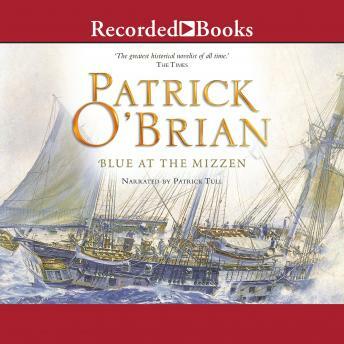 Blue at the Mizzen hoists the excitement to new heights as British frigate commander Jack Aubrey stakes everything on a desperate raid against the mighty Spanish fleet. Ever since Napoleon was defeated at Waterloo, Captain Aubrey's prospects in the new peacetime navy have looked dim. Even worse, his frigate Surprise was badly damaged in a nighttime collision. While Aubrey waits for repairs, ship's doctor Stephen Maturin brings him intriguing information about the New World. Soon Aubrey is leading a bold expedition that will determine the fate of a rising South American nation - and his own. Critically-acclaimed author Patrick O'Brian blends authentic period atmosphere, rich humor, and elegant language in each of his seafaring yarns. You can almost hear the thunder of the waves and smell the salty sea air as you listen to Patrick Tull's dramatic performance.